Except for the peak Tri Koruny (Three Crowns) it is the most beautiful and the most popular peak in the Pieniny Mountains (altitude 747 m). 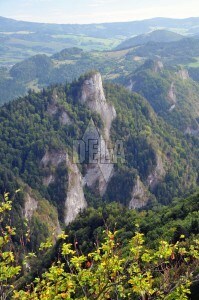 It is situated at the end of the Dunajec Canyon in sc. Pieninky. Its rocky walls fall steeply down to the Dunajec River. From the top you would have breathtaking view. Marked tourist trails are occasionally secured by chains. You can start in Szczawnica or in Krościenka.